Jeanette likes the chunky texture of stone chips, but finds that they are often uncomfortable to wear. 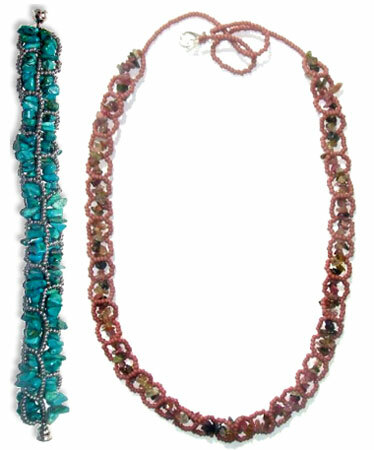 This necklace features a single row of RAW beaded chain. Stone chips are woven through the RAW links. Single lengths of strung beads complete the necklace at the back of the neck for comfort. Use birthstone chips for special, personalized, gifts for family or friends. Accent a double row of RAW for a gorgeous bracelet!